Tater Tots, also known as "Tots", a registered trademark for a commercial form of hash browns, is a side-dish made from deep-fried, grated potatoes. Tater Tots are widely recognized by their crispiness, cylindrical shape and small size. 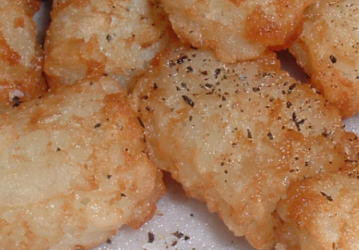 Left: A close-up of a plate of Tater Tots. Tater Tots are commonly found in the U.S. in cafeterias and school lunch-counters, as well as the supermarket frozen food aisle and some fast food restaurants. The Burger King fast food franchise offers a tater tot variant, dubbed "Cheesy tots", as a regular item available on both its breakfast and lunch/dinner menus. Cheesy Tots are coin-shaped and, as implied by the name, contain melted cheese as well as potatoes. Several restaurants in the Pacific Northwest offer a nacho version of tots ("totchos"), covered in nacho cheese sauce and toppings. Tater is slang for potato; Tots may have been derived from their diminutive size, or because they are often served to children.